I had given up dreams of wearing flip flops. Then Saturday happened. Glorious sunlight and suddenly everything seemed possible. We found out state parks and walkways near by and marauded them. Breathed fresh air and drank in the verdant beauty all around. Hm...! Nice. Am I glad or am I glad! I wore my flip flops too. The fruity treat today called unnakai is a Malabar specialty. I have seen it in many blogs and had to try it myself. 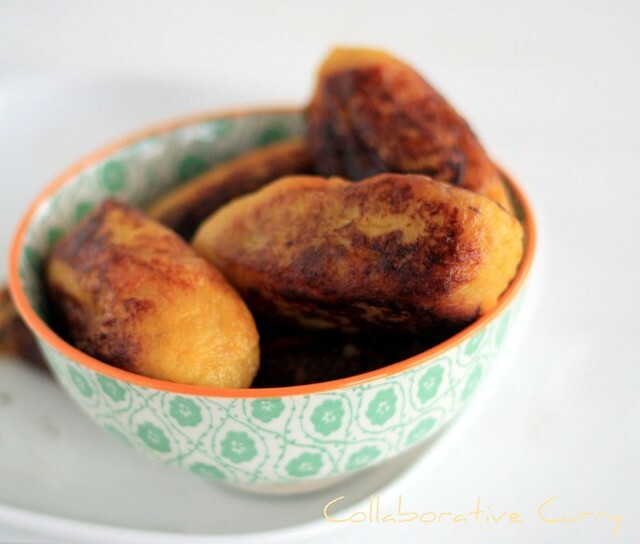 We are huge fans of plantains at home so decided it won't go waste. Making a sweet treat is quite a hefty decision these days. It's no good for me but my husband loves them. The only balance I can strike is to make only for him and resist it myself but that is asking a lot. But with plantains I decided its going to be okay. And it sure is. I have stayed away from the coconut filling which traditionally is the filling and instead used dates and cashews. They are irresistible. If I say so myself! 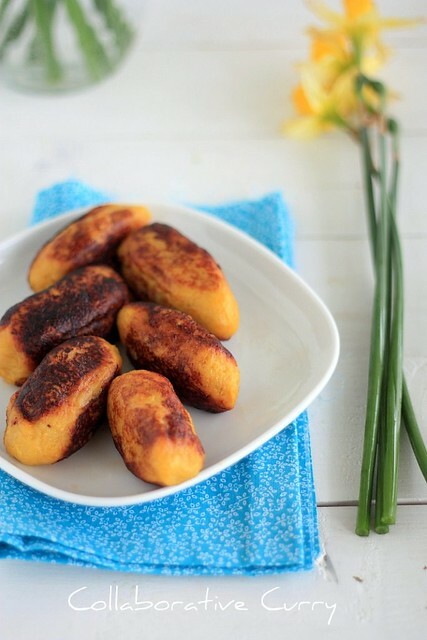 Plantain – 2, cut into four pieces, skin on. 3. Cool, peel and cut each piece lengthwise and seed them. 5. Stew the dates for about 5 minutes. Remove from the liquid and chop into fine pieces. 7. Make 8 equal parts of the mashed plantain. 9. Heat a pan for shallow frying, add about 4 tbspn of oil, and slide in the shaped plantain. Turning carefully brown on all sides. Serve as a dessert. This is a 'truly tempting' snack...So sweet! Loved the plantain fry dear. Also the fillings made it even more inviting. Pefect for evening snacks.. Love this filling..
Wat an authentic dish,simply inviting..
Yum !!! That sounds so great !!! i have never tasted them surely looks delectable! New to me but looks really yummy. Looks delicious and very tempting! This is so inviting and tempting.. Seeing a lot of yummy looking snacks today.. Tempting me to make something for us! I have never heard of this, but it sounds delicious. I'll have to give it a try very very soon. I've got a perfectly ripe plantain begging to be used! 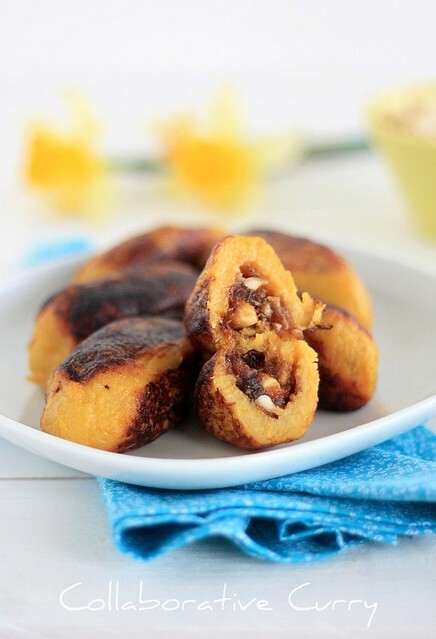 What a fabulous dessert with plantain - I have never heard of this altho I boast to have Many malu friends in the past and presently :(, but then I guess not too many of them are foodies ! Awesome, mm mmm good recipe! I just bought some plantains yesterday and was wondering what I should do with them. This is a great idea, surely inspiration for whatever creation I come up with! 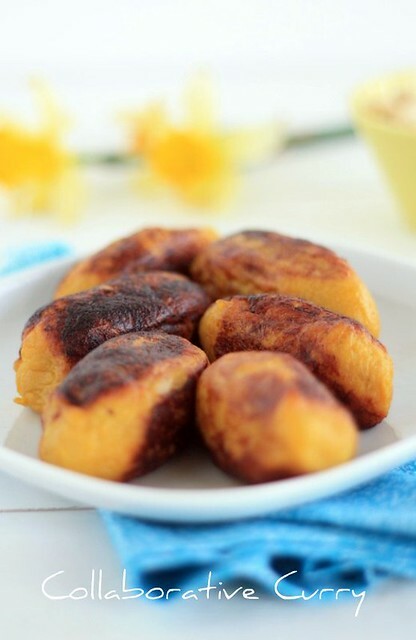 Plaintain fritters they look awesome.